Each outdoor film, shown on Tuesday evenings, is jointly programmed (with DCASE) by a different, independent, Chicago-area film festival. For example, “WALL-E” is a double feature with the film “Crash,” presented by the Peace on Earth Film Festival at 8:30 p.m. that same evening. Family and friends can either sit in chairs at the Jay Pritzker Pavilion or spread out with a picnic on the Great Lawn while watching films on a state-of-the-art, 40-foot LED screen. Outside food and beverages, including alcohol, are permitted at this film series, and refreshments are available to purchase from Goose Island Beer Company, Riboli Family Wines and Pepsi at various locations throughout the park. The 2008 film “WALL-E” is a 98-minute, G-rated film. In a distant, but not so unrealistic, future, mankind has abandoned the trash-covered earth, and WALL-E, a garbage collecting robot, has been left to clean up the mess. Mesmerized with trinkets of Earth's history and show tunes, WALL-E inadvertently embarks on a space journey with his sprightly pet cockroach that will ultimately decide the fate of mankind. 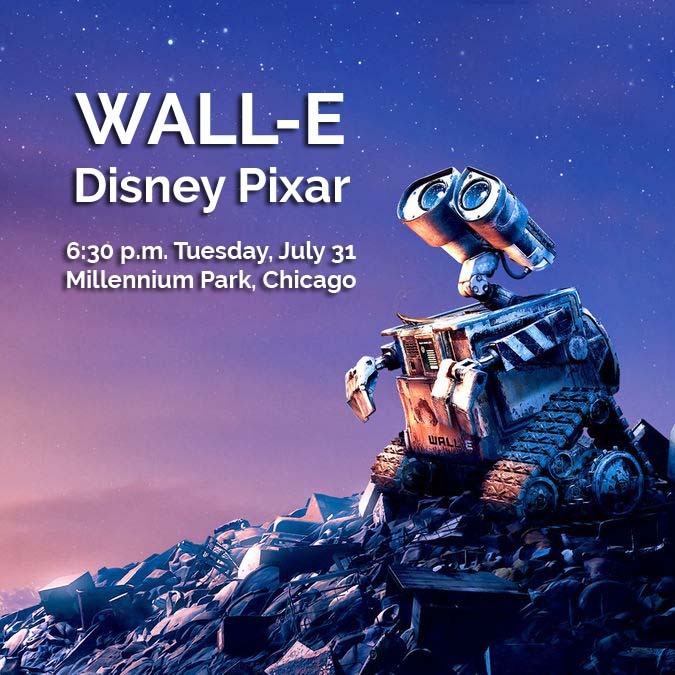 Millennium Park Summer Film Series is brought to you by the Millennium Park Foundation, produced by the Department of Cultural Affairs and Special Events and sponsored by the Chicago Transit Authority. In addition, the series is partially supported by a grant from the Illinois Arts Council. Millennium Park is located on Michigan Ave., bordered by Randolph St. to the north, Columbus Dr. to the east and Monroe St. to the south.